Ovarian Cancer Ultrasound - What to Expact? An ovarian cancer ultrasound is one of several diagnostic tests that your doctor will use to determine if ovarian cancer is present. This ultrasound makes it possible for your doctor to obtain real time images of the current status of the ovaries as well as the rest of the reproductive system. Non invasive and usually free of pain and discomfort, an ovarian cancer ultrasound can be the means of identifying the presence of cancer on the ovaries or in nearby tissue early on, making it possibly to initiate effective treatment that can save your life. Another common name for this type of test is a transabdominal ultrasound. Women who have never undergone an ultrasound are often anxious about the specifics of the procedure. Unlike a transvaginal sonogram the transabdominal ultrasound is non invasive and quite simply involves a small electronic device being run over the surface of the skin. Any female who has experienced a pelvic exam will find that this exam is very similar in terms of preparation and the environment in which a normal ultrasound takes place. There is no need to check into hospital in order to have an ovarian cancer ultrasound. 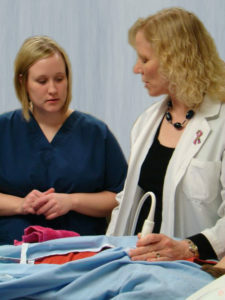 The test can be performed in your physician’s office, using an examination table and some simple equipment. In terms of duration, an ovarian cancer ultrasound generally takes a very short period of time (10-30 mins), and your physician can assess the results during the actual process. This means there is no long waiting period to get your results, and no need to schedule out an entire day or longer to undergo the test. With the actual ovarian cancer ultrasound, you will be asked to expose your stomach, and lay flat on an examination table. Your physician will then apply some clear gel (which can be a bit cold) on the surface of your skin to better conduct the images. Next, your physician will run a transducer over your lower abdomen. As this transducer emits sound waves, it creates images of the ovaries and the surrounding tissue that are transmitted to a nearby monitor. Your physician controls the direction of the transducer, making it possible to observe the condition of the ovaries from more than one angle. It is not unusual for your physician to ask you to refrain from food or drink for several hours prior to the ultrasound. In addition, you may be asked to have a full bladder. This is because air (In an empty stomach) can interfere with the sound waves. This precaution will make it easier for your physician to obtain clear images from the transducer, and identify any nodes or cysts that may be present on the surface of the ovaries. Clarity is important, as it can go a long way in determining the size of any abnormal growths, as well as observing their appearance as part of the process of determining if the growths seem to be benign fibroid tumors or a malignancy. Most women experience little to no discomfort during this ultrasound. However, there are instances where you may feel some slight pain at one or more points during the test. It is important to tell your physician immediately if the discomfort increases, as this may provide a valuable clue about the general condition of your ovaries and other components of your reproductive system.